Search Engine Optimization is the biggest source for loyal readers. SEO is the most fine way to Introduce your blog to the world, without spending on those PPC programs which works for a finite period. This tutorial will help you improve SEO Performance and ultimately SEO Optimization to improve your Search Engine Rankings.Every blogger must be knowing this fact, that Search Engine Optimization and Search Engine Rankings & Positions are the most important keywords for getting Google love, and I don’t think any other Search Engine works as Google. Without wasting more time, I would like to Introduce to you 3 Amazing sites which would help you analyzing your content on Google, tracking and optimizing the SERP with the help of the data collected. Open Site Explorer is the most advanced SEO Tool yet, created by SEOMoz. After entering the URL of your blog, it displays various results including the Links, outbound and inbound, sites which are linking to you alongwith the anchor text and much more. Unfortunately, if you don’t have premium account on SEOMOZ, you can see only 3 reports a day. 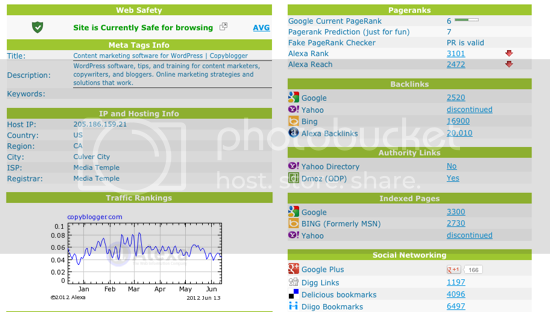 Website analyzer is all in one online tool for analyzing aspects of your blog’s SEO. It crawls your blog in some time and displays various ranking factors that help you to gain Ranking Positions in Search Results. It displays Pagerank, mozRank, Authority, Alexa rank, backlinks from Google, Yahoo,Social Networking statistics and other bunch of factors. SEMRush is another great online tool, it helps in analyzing the SE traffic and the keywords you are focusing, and how these keywords are getting indexed on Search Engines. And the most amazing part of SEMrush is that, it displays the almost exact Search Engine Traffic that you must be getting on your blog. The above three sites are enough to track where you are leading and where you are lagging. You can track what keywords are you targeting and how is your Search Engine are affected by the keywords you are using. You can see how much of your blog posts are indexed in the Search Engines, and how much backlinks you are getting from external sites. These factors are always helpful if you are focusing on your blog’s SEO optimization. If you are not using Google Webmaster Tools, then you should because its the gateways between your blog’s SEO and the giant search engine, Google. You can manipulate how your site looks in Search Engine using Webmaster Tools.